Several days ago I started this series about using Mod Podge for paper quilled jewelry. In Part 1 (click here to read it) I showed the different finishes that I was using, some basic information about mod podge, and my first impressions of it. 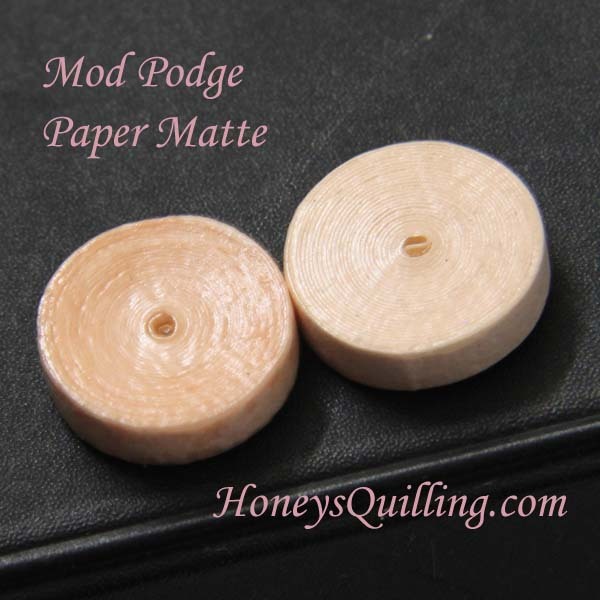 In today’s post I will be talking about using Mod Podge on tightly rolled quilled jewelry. This includes flat circles, spirals, large shapes made from tight rolls, jhumkas, etc. For this test I made 9 tight rolls from pale pink quilling paper. I left one plain with no sealant at all. Four of them I dipped into liquid sealer (I used Ceramcoat All Purpose Sealer ). 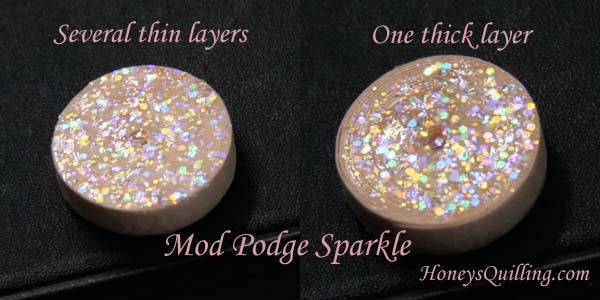 I usually use a sealer for my quilled jewelry, so I wanted to test the mod podge with and without it. This liquid sealer soaks into the paper and makes it very stiff. I like to use it before using a topcoat since it makes the jewelry nice and sturdy! As you can see it also makes it a shade darker. I don’t mind that, it’s worth it to have that sturdiness factor! Okay, back to Mod Podge! I then used Mod Podge Matte on a plain tight roll and one with sealant. I used Mod Podge paper matte on a plain tight roll and one with sealant. Same with glossy and with sparkle. Here are all of the tight rolls together. The center one is the plain one, nothing on it. From left to right the finishes are matte, paper matte, glossy, and sparkle. It wasn’t very easy to get a good photo of the finishes on a white background. I’m not sure why. So I ended up taking some photos on a black background and it was a lot easier to see. So the rest of the photos here are on black. 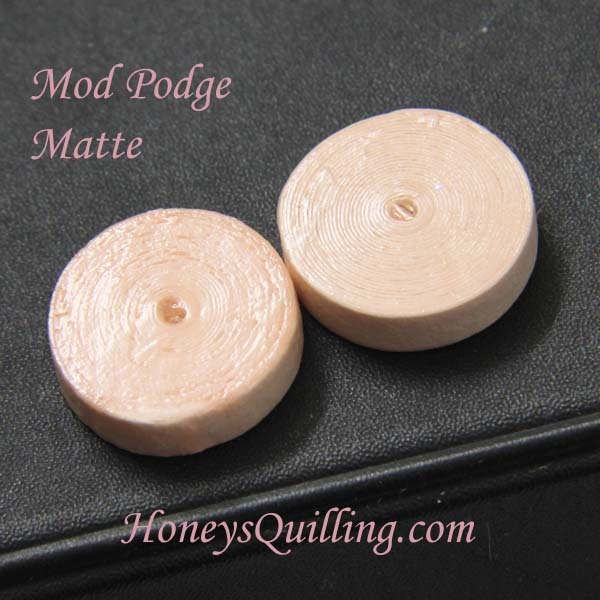 Here is a closeup of the Mod Podge Matte. The one on the left has the liquid sealer. One thing you’ll notice is that with the pieces without the sealer you can see the paper lines more easily. With the pieces that have sealer, the lines are not so easily distinguishable. As if the sealer kind of molds them together. The Mod Podge doesn’t sink into the paper like liquid sealer does, it just stays on the top so you can see the lines. Next is Mod Podge Paper Matte. The one on the left has the liquid sealer. You can tell in this photo that it is a little darker than the one with just Mod Podge. Next up is Mod Podge Glossy. Here you can see that it is definitely more shiny than the matte and paper matte. And again you can see that the one with the liquid sealer is a tad bit darker. Finally Mod Podge Sparkle! This time the one with the sealant is on the right, again a little darker in color. The sparkle is really hard to photograph properly. It is a fun effect, though. For all of the above photos I painted on several thin layers of the Mod Podge. The instructions on the bottle say to do this. I wanted to see what would happen if I just put on one thick layer instead of multiple thin layers. So on the other side of the tight roll (the one with no sealant) I dabbed on a thick layer of Mod Podge, tried to get it even, and then let it dry. The results are here. The main conclusion with this test is that Mod Podge definitely needs to be painted on in thin layers! A thick layer just doesn’t work well with this product. It is dimensional, meaning that it won’t flatten out and even out on its own. So if you dab it on and there are bumps in it when it is wet, there will still be bumps in it when it is dry. Optimally the layers should be very thin, no blobs of the Mod Podge visible. First is the Mod Podge Matte. You can see with the thick layer that there were some bubbles that I couldn’t get to pop. Those areas with the bubbles are thicker than the other areas. Now Mod Podge Paper Matte. You can see again that the thick layer wasn’t even. You can also see that the Mod Podge Paper Matte isn’t completely clear with the thick layer. If you have read my first post about Mod Podge you will have seen that Mod Podge Paper Matte has a yellowish color to it. You can’t tell when it is super thin, but with blobs you can tell. 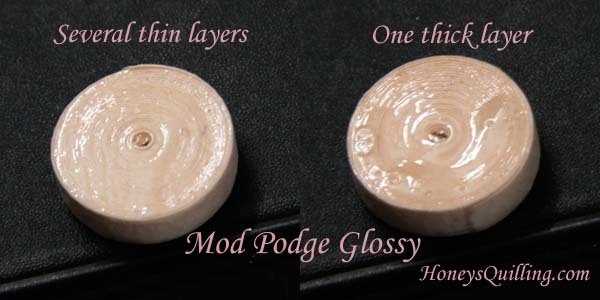 Mod Podge Glossy. Again you can see the uneven layering of the thick layered one, along with some bubbles. 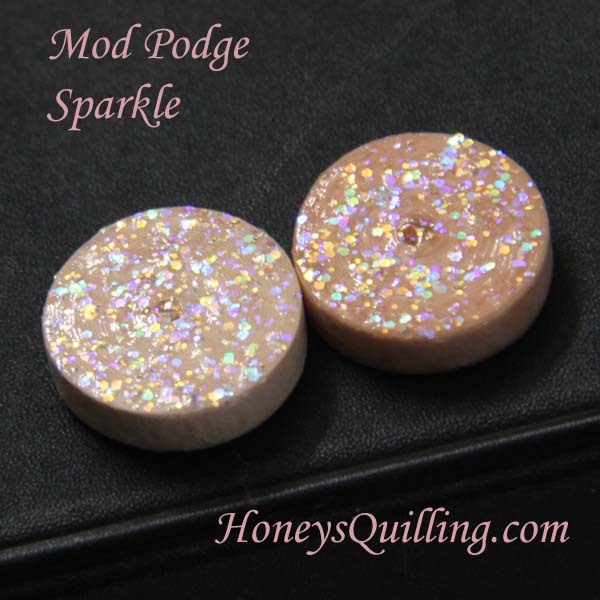 Mod Podge Sparkle. This one is interesting. The sparkles let you see something that the other finishes don’t let you see. With the thin layers the sparkles are even all over the tight roll. But with just one thick layer, there are many more sparkles in the middle, and hardly any around the edge. Obviously because around the edge is much thinner than the middle when you put on a thick layer. 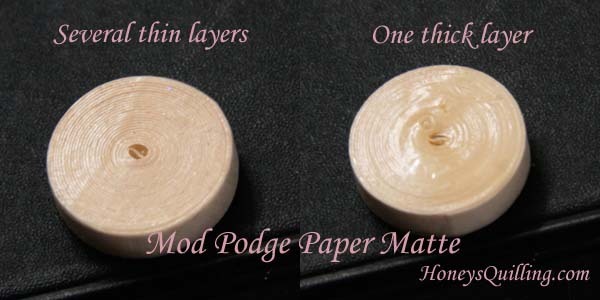 Using Mod Podge on designs with tight rolls is straight forward. You don’t have to worry about getting it into crevices or your rolls uncoiling. But you do have to remember to do several thin layers instead of thicker layers for the best look. Also remember to let one layer dry before adding the next. Using Mod Podge will give you a water resistant surface, but it is very flexible and will not make your quilled jewerly stiff/sturdy. If you want your piece to be more sturdy, apply a liquid sealer first, allow it to dry, and then use the Mod Podge on top of that. 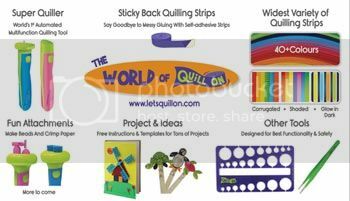 In the next couple posts you will see Mod Podge being used on moderately tight quilled designs, and looser quilled designs (all for jewelry). 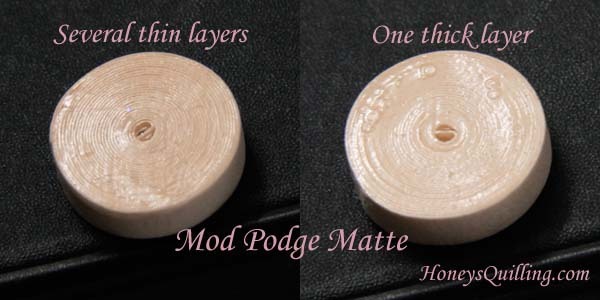 Hopefully all of these posts will help you decide whether Mod Podge will work for you and which finish you would like to try. What a wonderful job you are doing with all this info! Thanks from everyone who will read it! Your information is clear and easy to understand. I enjoy seeing what you come up with next! Thanks so much for your kind comment, Kathleen 🙂 I’m glad the info is very useful, that is my intent!